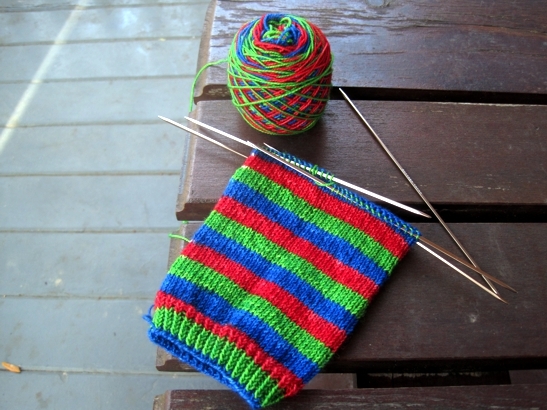 It's funny how, in spite of my best efforts, I keep defaulting back to the joyously easy knitting of socks. Perhaps it is the joyously easy nature of wearing handknit socks. I've been walking pretty fair distances every day this fall, training hard for the marathon walks I'll be doing in Italy next spring, and mostly I'm wearing my handknit socks to do it. 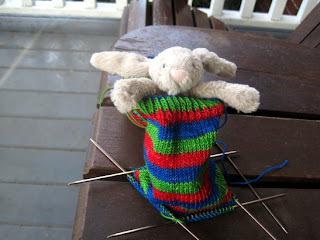 2/ those seams on the toes of machine-knit socks and tights get really hurty after a while. I was once again trying to persuade her that socks are awesome to knit and she was once again telling me that socks drive her crazy, and I was still reflecting on this on my way home when it occurred to me that Trish had been knitting a cowl for somebody else. In fact, practically everything Trish knits is for somebody else. She is pretty much the queen of gift knitting, and she doesn't even wait till special occasions beyond, say, You looked cold yesterday or This colour reminded me of you. Now, when you are a selfish yet prolific knitter like me, you quickly realize that you cannot knit another cowl or hat or scarf or shawl because you simply can't wear that many of them. Socks on the other hand - you wear those every day, and then you need to wash them so they're taken out of circulation while they dry. Sock knitting projects are practical in a situation like that. If on the other hand you have a constant and widespread demand for cowls and hats and lace scarves, you can knit them to your heart's content and never question whether you could get away with layering two hats today just so the other one doesn't get any dustier waiting for its turn to go out. Come to think of it, now that she knows how to knit, Jill is also knitting a ton of things for people other than herself. H'mmmmm. I'm kidding, I keep no knitting secrets. now that I'm well into the socks and would cry if I had to rip them out, the teeny tiny tail is working its way loose from the ribbing where I attempted to run it in. I think I'm going to have to take drastic measures like, I don't know... handstitch it in place, with thread? At least the Home Sock is looking lovely. 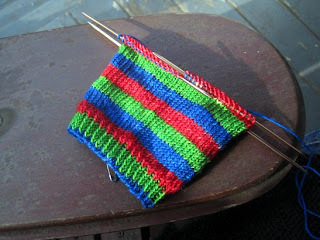 ahhhhh, how happy I am to be knitting these stripes. And how happy I am to wish all my American friends a superfabulous Thanksgiving. May your feasts be delicious and your shopping, more so!